Prep for the activity by cutting the paper plate into a heart. Punch holes in the heart. Cut a piece of yarn and tape one end to the back of the plate. Tie the child’s threading needle to the other. Show the child how to lace. Encourage them to try it on their own. When finished, remove the needle and tape the string to the plate. 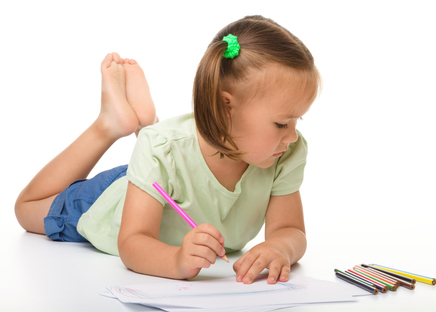 Young children require extended and unhurried periods of time to develop their creativity. As young children’s enthusiasm for investigation and exploration develops, they often become absorbed and concentrate for long periods of time. In addition, they may want to revisit an experience several times while they extend and consolidate their learning. This requires the teacher to be flexible in their approach to the allocation of time. This could be over the course of a day or a week, or even over an extended period, to allow young children to become involved in the long-term exploration of something which particularly interests them. Teachers should offer young children adequate time and space to explore ideas within an enabling environment. You should stand back sufficiently to notice what intrigues, confuses and inspires the young children you are working with, so that any intervention occurs from a closer understanding of children’s creativity.